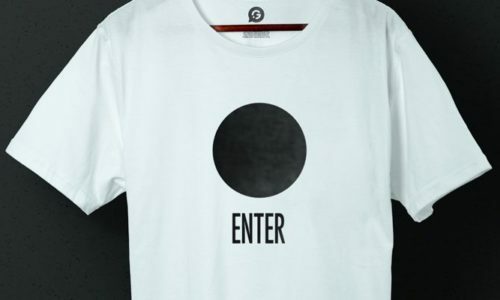 With the release of DJ Richie Hawtin’s newest concept music experience ‘ENTER’ at the world-famous club Space in Ibiza, we were asked to handle the printing and merchandising of exclusive T-Shirts. Water Based screen printing and eco-friendly T-Shirts for Richie Hawtin’s New Concept: ENTER at SPACE Ibiza 2012. For the event, we decided to use Tencel’s Novel Fine Jersey as it’s made from textiles derived from the eucalyptus plant. This means it’s an eco-friendly T-Shirt printing option which is characterised by it’s decreased environmental impact and increased cooling abilities. It also boasts a softness which is comparable to cashmere and silk. The clothing was to be printed with the events spherical element which is designed to symbolise the ENTER event, a limitless realm of exhilarating experience. There was also printing of the headline of the event, ENTER and the club logo for SPACE on the back of the Tee. For this, we opted to use Screen Printing as it allowed us to produce the clothing range quickly and the eco-friendly water-based ink was a perfect match for the eco-friendly tee. Garment Printing continues to provide printed clothing for the events of Richie Hawtin.